Although I’m completely addicted to the internet, I still love a good old written diary! There’s nothing better than curling up on your sofa of an evening and updating your private thoughts in a book, which when you pull out in a year or two, you can read back and have a good old chuckle to yourself! Recently, I came across the very awesome My Life Story Book. It’s huuuuuge and will certainly last a very long time, if not forever! Such a great, memorable gift for Christmas. Especially for mothers to be who want to record every moment of their child’s life! You can put photo’s, receipts, tickets and anything else you might like to keep. 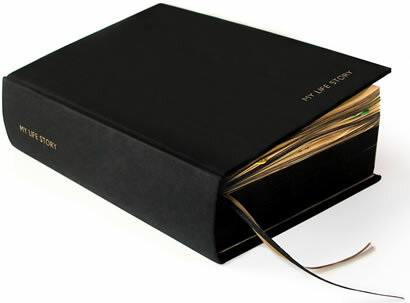 They’re also ideal to use as a travel journal, wedding journals or just a daily ranting journal. The choice is yours!! !